When acclaimed Latin artist Eva Garza sang boleros, dance music, for Decca Records during the 1950s, her niece Leticia Rodriguez listened to her records. The creative spirit and music moved Rodriguez as a youth to dance and enroll at the Houston, Texas, Discovery Dance Group during her early teen years. Later as an adult she followed her creative spirit and joined the well-known Sharir Dance Company, and then taught with the Believe in Me organization, which is affiliated with the National Dance Institute. She has been interviewed on Public Radio International’s “The World” and her tour schedule is quickly growing. In this interview, Rodriguez talks about her musical roots and her love of music. The making of your album took a while, but tell us what makes this CD special for you? 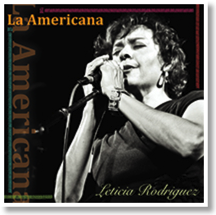 Letricia Rodriguez: There are several things that make this CD special for me. Selecting only one to write about is challenging. Without doubt however, the most important outcome from the making of this album are the insights that have been gained by creating an all Spanish speaking album by a fourth generation English speaking Tejana. The decision to create an all Spanish-speaking album was in response to oppression during my parent’s generation. This generation was not allowed to speak Spanish in school. They were punished, shamed and fined. This legacy in turn created a large population of Mexican Americans that have great difficultly with the language, and in turn affects their children, and so on. I am English speaking, speak Spanish with great difficulty and have spent all of my life studying this beautiful language. This is the story of many immigrants, and I cannot impart the loss and anger that has plagued me over years, by this ignorant act. Through La Americana however, I reclaim my language and culture, liberate myself from this form of oppression and bring attention to this issue for others to consider. Through this album, I speak my ancestor’s tongue with ease and love; I have a renewed commitment to learn about my heritages, and share this music with people with similar experiences, as well as the general public. My awareness has grown through the performing of this music, and I find it increasingly important to recognize more clearly forms of oppression and foster dialogue to address these issues. What was the hardest thing about recording it? Having produced, directed and performed all of my life, the hardest challenge for me was to engage in a collaborative process with the producer. I had a very strong vision about the album, but not enough musical knowledge to communicate to others how the album should sound and feel. I realized that in order to develop the album I needed someone who had that musical background I lacked. It took two years to find the right producer for La Americana. Lisa Morales (formerly of Sister Morales) was the right person for the job. That being written, there was a considerable amount of learning each of us had to do in order to engender the trust needed to collaborate with freedom and develop a unified vision. Both of us were equally committed to the project, and over time, grew to love and respect each other deeply through the process. We are both strong-minded, passionate, fearless Latin women and have become deep friends from this process. Do you have a story about being in the recording studio you haven't told anyone yet? I had envisioned the song “Volver” to be something very interpretive. We had four guitar players enter the studio over time to record this song with me. However, it was impossible to find someone who could deliver what I was hearing in my head and each recording of the song, was lacking. The final studio recording I made of Volver, the guitar player played alongside me, but I closed off my ears and sang in essence, to myself. I made a decision during this session to send my voice track to France, to my friend, Christian Fernandez, who would subsequently compose the accompaniment around this music file. Having worked with him previously in the United States, I knew he had the skills to create what I needed. It is one of my favorite songs on the album. The recording process was a journey, literally and figuratively. If you could fast forward into the future, what might your next record sound like? What more will you impart on Americana music? Regarding the short term, there is a treasured song, formerly made famous by Eva Garza that I will release in 2014. It is a song lost in time, a son that took me seven years to hear, (and yes, there is a story behind this to be told in the future.) My tia, Ernestine Moore, and my mother, Sylvia Rodriguez, were the people, who introduced this song to me, and they have tremendous knowledge of music and Eva Garza’s history. Eva, I’m certain, would love to have this song revived. Longer term, my intention is to continue to release relevant music of Eva Garza and other Pan American treasures while developing my own music that embraces music with a more global sound. My “Americana music” will continue to be filled with Latin influenced sounds, as well as other traditional forms of roots music. I continue to work on music of my own based upon melodies created and collected over a lifetime. Whether or not, these are published, they help me clarify my musical direction. My family, my heritages and my love for inclusion of other cultures will always influence me. In your spare time how do you relax? I love to read in bed, science fiction, Spanish novelas and poetry. I love to cook creative meals for family and friends while listening to music and drinking a glass of wine. I love to bike ride, especially coasting down a long hill AND travel to places with rich histories and culture. Would you like to say anything else about your love of music? With each breath, I sing with love. Music and Art IS life, is love. Creating music is about communication, love and acceptance. It is about healing; it is about growing and changing our perceptions toward positive social change. Through the creative process we discover and expand love. With love, we hold the possibility, with consistent effort, of making our world a more sustainable place for all living beings. Editor note: This interview was emailed to us by the artist.